Ruddy Bits: What do Luis Suarez and My Three Year Old Have In Common? What do Luis Suarez and My Three Year Old Have In Common? My three-and-half-year old son has something in common with one of the most talented soccer players in the world, and I’m not exactly happy about it: They both bite. Those words, sadly, have been said around our house far too often in recent months. We thought he was through the biting phase – which usually happens for most kids around age 1, or maybe 2, when they are forced to move on from binkies (pacifiers) and other oral addictions, yet aren’t quite equipped with the words needed to express themselves. “Don’t bite! Use your words!” That’s something that has been yelled – sorry, I mean emphatically suggested – around our house over the years. We thought our boy understood that biting is widely considered socially unacceptable, and we figured he understood it years ago. I mean, he’s three after all. Three year olds know this, right? At least, three-year-old girls do. And that’s all we had experience with before he came along. Clearly it would, because biting just isn’t something adults do. For those who don’t pay attention to soccer … or news … or Facebook … or random banter around the water cooler … a world-famous soccer player, who plays for Uruguay’s National Team and led the English Premier League in goals this past season as a forward for Liverpool, went ahead and bit someone during a World Cup game. That’s right. He bit someone. Sadly, it wasn’t his first offense. He’s bitten before; He's bitten twice before to be precise -- and to sound vaguely like a bad 80s’ song. 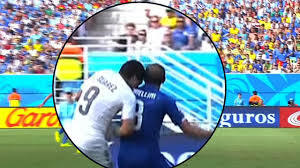 Suarez served a suspension for biting an opponent in 2010 in a Dutch league. Then he did it again last year in the Premier League. 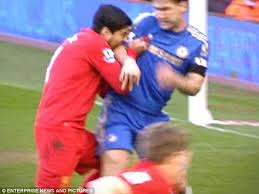 This past year he seemed more intent on scoring goals than chomping on opponents, so lots of people forgot his cannibalistic past. Then, with a global audience watching one of the biggest matches of the world’s biggest sporting event, he struck again. One Millionaire Bites Another. Again. This world-class player, and now world-renowned jerk, may have just written his own exit from international soccer, and possibly the professional game altogether, all because he couldn’t grasp what most three-year-olds understand: that biting is unacceptable. Most three year olds -- except mine, that is. Still, I’m holding out hope that our child will learn this lesson, at least before he starts kindergarten. If not, there’s always soccer.